There is the pretty little textile bag which is suitable both for girl and young lady. 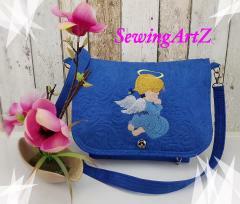 It is made of cotton fabric of intensive blue color with the embroidered figure of little angel praying on the knees. 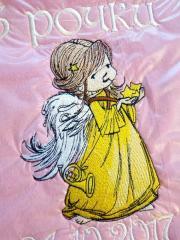 Little cute Angel machine embroidery design is executed in color scheme which fits perfectly the shade of background. And finally the texture made by tight stitches combines nicely with quilted surface of the bag. There is a picture of young fairy in light dress looking right at you. This image is made with the scheme of Modern Fairy embroidery design. Due to the usage of light threads for embroidery and light shiny fabric for background make this playful fairy look like angel. The embroidered patch of the whole product perfectly underlines the intensive purple color of the other pieces of this spectacular bed cover. There is the fragment of textile accessory decorated by the picture of little baby with curly brown hair and nice wings behind the back. The child is sniffing the huge splendid red rose which is almost equal to his growth. 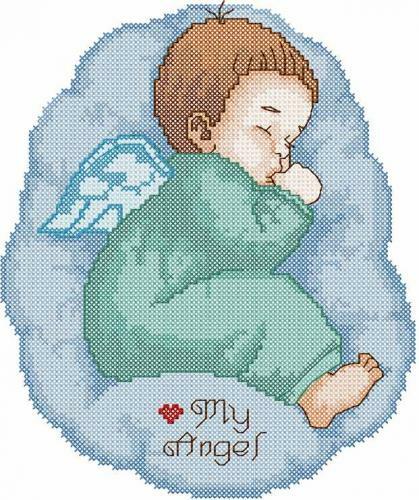 Baby angel with flower free embroidery design is the image which is the great embellishment for bed linen or any textile accessories for home which are made in pastel shades. This picture shows the gift for the birthday of little boy with the mention of the date. His name and other words are embroidered by beautiful golden thread reminding frames of the icons in church. The main part of this gift is the figure of guarding angel who will care for the child during all his life. 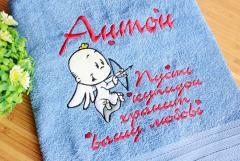 Angel with flowers machine embroidery design is executed with tender and love for the addressee. This picture is the macro plan of embroidery sample made on the base of Star angel machine embroidery design. The author just needs to remove some assistive threads and plastic cover to show this picture in all its beauty. 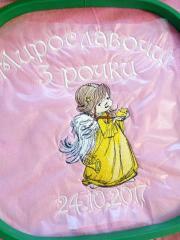 It is the image of little girl with big white wings behind her bag. She is bringing some bright golden stars in her hands and one more star is in her hair. 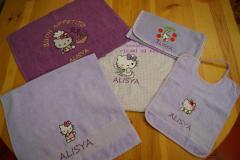 There is the nice memorable textile gift for the third birthday of little girl with beautiful name. The work piece has traditional girls’ pink color. 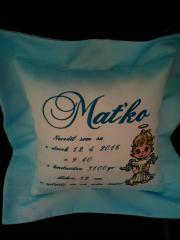 The inscription on the cushion shows the date of the birthday and name of the addressee. It is also decorated with Star angel machine embroidery design. This embroidery sample seems to be painted with thin black pencil and then colored into yellow, white and brown shades. 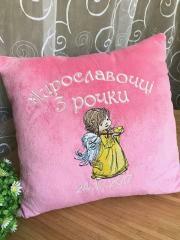 This soft embroidered cushion is the unusual and pretty textile souvenir for memorable date or any other event. It is made from fluffy fleece of gentle pink color with long fringe on the sides. 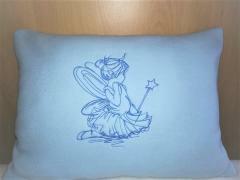 But its main highlight is Stars for angels machine embroidery design. It is the silhouette of little angel who is catching the stars from the sky. 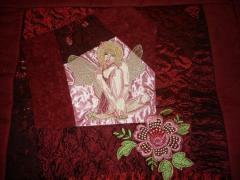 It is executed by thin stitches of pink thread so the angel’s figure is barely visible on the surface of the pillow. Angel in the palm machine embroidery design Author: Denise Lacerte Author comment "I added this fabric card, and told him when he opened the box, that he has a Angel to watch over him. I connected the card with some velcro so it will stay inside the lid for good. —"
This is pretty little handbag with original design made by Maria Stiansen‎. It has quite small size but at same time it is enough to hold all things you need every day. You may keep it in hands or put on hand due to convenient textile loop. Its front side is decorated by some samples with images of cats. 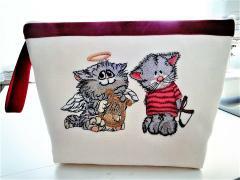 One of them is Angelic cat embroidery design 2. This picture is fragment of pretty interior cushion decorated with original sample. It is Before performance embroidery design shown on the photo in macro plan. 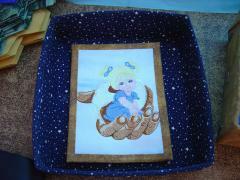 It is just silhouette of little girl sitting in costume of fairy. She has little transparent wings behind her back and magic wand in her hands. It is easy sample made with just one color of thread. This is pretty cushion with simple and nice design. It is decorated with Before perfomance embroidery design. 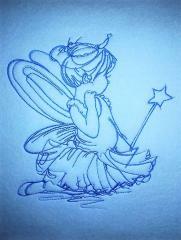 This is one silhouette of little girl with magic wand in costume of fairy. It is executed with only one color of thread and has just some lines. So this cute picture is available even for beginners. Don’t loose possibility to decorate your interior accessory with this nice sample!